Supreme CBD Kush from Nirvana seeds is a medical marijuana strain with the much coveted 1:1 ratio of THC and CBD. Nirvana seeds managed to create supreme CBD Kush seeds by isolating a high CBD genetic trait and crossing it with a G13 Haze x OG Kush strain. Because of the high levels of CBD this strain is perfect for medical users who are not always looking to get completely stoned but are more interested in the medical benefits of Cannabis. Nirvana Seeds gathered loads and loads of genetics that could possibly create CBD rich offspring and they started experimenting. Eventually they stabilized a CBD rich strain, they lovingly call The Supreme. They crossed this CBD-rich strain with a G13 Haze x OG Kush clone and after several generations of stabilizing we came up with the coveted 1:1 CBD:THC ratio. Nirvana Seeds Supreme CBD Kush has 9.5% THC and 9.5% CBD. The G13 Ultra CBD is a Sativa/indica hybrid (70/30) that carries typical Sativa traits (height) as well as typical Indica traits (effect). Because of her G13 haze roots she does tend to stretch, so please adhere to a limited pregrow period. Perfect strain for using the SCROG method. She’s a hug yielding strain that flowers in roughly 75 to 85 days. CBD works as an antagonist to THC and therefore counteracts the psycho-active effect of THC. Paired with a relatively low % of THC and a high % of CBD the high is a very much physical that releases tension and relaxes the body without the raciness of your usual Sativa. Therapeutical benefits of THC: Analgesic, anti-spasmodic, anti-tremor, anti-inflammatory, appetite stimulant, sleep inducer and anti-nausea. Therapeutical benefits of CBD: Anti-inflammatory, potent inhibitor of tumor (cell) growth (initial research has shown, more research and trials are currently underway), anti convulsant (epilepsy), anti-psychotic, anti anxiety, suppression of immune responses, anti-oxidant (anti aging), anti cramps and spasms and acts as a neuroprotective after an insult, seizure or stroke. Studies have proven that strains with 1:1 ratio of CBD and THC will give an optimal relief for a great number of the above mentioned Therapeutical benefits. 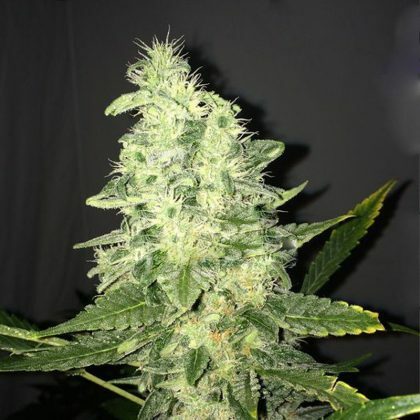 Supreme CBD Kush Genotype: (G13x OG Kush) x CBD (the Supreme) Yield: 450-550 gr/m2 Flowering: 75-85 days Height: 120-160 cm We gathered loads and loads of genetics that could possibly create CBD rich offspring and we started experimenting. Eventually we stabilized a CBD rich strain, we lovingly call The Supreme. We crossed this CBD-rich strain with a G13 Haze x OG Kush clone and after several generations of stabilizing we came up with the coveted 1:1 CBD:THC ratio. Our Supreme CBD Kush has 9.5% THC and 9.5% CBD. The G13 Ultra CBD is a Sativa/indica hybrid (70/30) that carries typical Sativa traits (height) as well as typical Indica traits (effect). Because of her G13 haze roots she does tend to stretch, so please adhere to a limited pregrow period. Perfect strain for using the SCROG method. She’s a hug yielding strain that flowers in roughly 75 to 85 days. CBD works as an antagonist to THC and therefore counteracts the psycho-active effect of THC. Paired with a relatively low % of THC and a high % of CBD the high is a very much physical that releases tension and relaxes the body without the raciness of your usual Sativa. For medical patients this strain with its 1:1 ratio offers the optimal pain management, muscle spasms. It helps reduce cramps with PMS. Supreme CBD Kush also diminishes the intensity and frequency spasms and tremors associated with Parkinson’s disease and MS. Research has also shown that CBD also potentially has cytotoxic (cell destroying) properties. So it could be therapeutically used, upon further studies and clinical trials, for battling tumor growth associated with cancer.